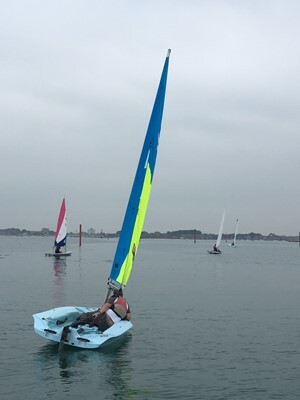 Five intrepid RNSA sailors set out on Thursday in the first of five RNSA(P) Dinghy Handicap race evenings. In a light SSE breeze the two Fusions, Laser, Laser Radial and Hartley 15 completed 2 close races around a triangular course in Portsmouth harbour. Lt Alex Thompson (Laser) and RC(Dinghies) Cdr Gav Marshall (Hartley 15) remained close throughout with each taking a victory. Cdr Andy Wood (Fusion) finished 3rd in both races while Musn. Brian Tregaskes (Fusion) and Lt Cdr Ian Watson (Laser Radial) each took a 4th place. The second instalment of the series is planned for this Thursday (14 Jun) with subsequent races on 28 Jun, 12 Jul & 19 Jul. In an amendment to the Sailing Instructions, the aspiration is to conduct 2 races each evening with up to 4 discards available in the series so no need to race every time – it’s all still to play for! At least 5 boats are expected again for this week so why not come down and get involved – 1630 at the sailing centre to start rigging and first warning signal at 1730. Boats can be booked via Lt Matt Irwin on navyoptrg-mwswsntun3@mod.uk or you can turn up on Thursday and sail any of the available boats.